‘We are delighted that Alain Simard was able to seize the opportunity to invite Charles Dutoit as a part of the MONTRÉAL EN LUMIÈRE. That fruitful period when Charles Dutoit was at the helm of the OSM, as we all know, ended unhappily in 2002. There had to be a peaceful way forward. 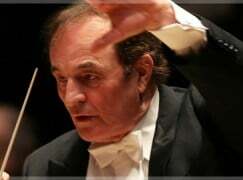 Charles Dutoit has contributed so much to our Orchestra. Since then the OSM has continued to develop, entering the 21st century in full command of its craft. Charles Dutoit’s efforts to secure a hall for the OSM which would befit the Orchestra’s reputation were taken up by Kent Nagano, resulting with the inauguration of the new concert hall in 2011. …With great enthusiasm, we all worked together to make the project of Charles Dutoit’s return to Montreal a reality. We hope that the Montreal public will be as happy as we are to reunite with him,’ stated Mr. Lucien Bouchard, President of the Board of Directors of the OSM. ‘It is surely a great moment in the history of the OSM to witness the return of Charles Dutoit as part of the MONTRÉAL EN LUMIÈRE. Charles Dutoit and I have known each other for many years, and it was he who invited me to conduct the Orchestra for the first time; he is a great artist for whom I have a deep respect, and who has led an impressive career. He accomplished so much with the OSM…’ added Kent Nagano, Musical Director of the OSM. A circus event? Mon Dieu, if Nagano had any balls he would insist on slotting Dutoit into the regular season. it is my understanding that nagano actually invited dutoit more than once since coming to montreal. looks like they needed a matchmaker (spectra) after all. I see. He should have said so publicly and emphatically, then, but this of course is not in his nature. News articles in the past said Nagano had repeatedly invited Dutoit back, with no success. I suspect his not coming back on the regular OSM program has something to do with the person conspicuously missing from the announcement: Managing Director Madeleine Carreau, who didn’t appear to do much to keep him from leaving back in 2002. Hopefully if this reunion goes well, he’ll come back into the fold and assume the honored “elder statesman” role he richly deserves. She should raise funds and artistically do as she is told. Wonderful news. Now, when can we get Dutoit back in Philly? I was saddened to see that Charles Dutoit isn’t coming back to the LA Philharmonic next season either, after a run of a dozen years as a guest conductor. They seem more interested in spending their money on Bill Viola and Roberto Bolle instead. Hope that he isn’t gone for good (Zubin, Dohnanyi, and other big podium names don’t seem to come anymore either). On a related note, Dutoit was just on tour with the Orchestre de la Suisse Romande, and the musicians sounded wonderful. Probably the most sublime Daphnis and Chloe Second Suite I’ve ever heard played live. And if Mr. Lebrecht didn’t harbor such ill feelings against the Orchestre de la Suisse Romande, perhaps he could’ve written about that tour instead of all that other insignificant news? The tour was not significant. They couldn’t get a date in NY. Keep him in Philly and don’t let him escape.